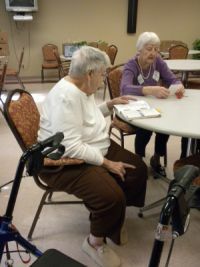 (CSM) provides weekly services in a “church” setting for the residents of seven senior-living facilities in the Irondequoit area. 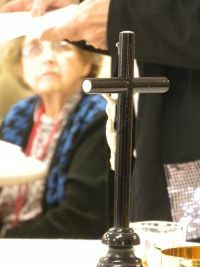 Trained volunteer ministers go out two by two at a regularly scheduled time to a senior facility to lead a Communion Service. The community worships the Lord with song, scriptural readings, prayer and most importantly, receives Holy Communion. In this way, Saint Kateri’s parish family stays connected through the Body of Christ with those who are no longer able to attend weekend liturgy. Become a Communion Service Minister! Your commitment is an hour and half a month but the rewards are abundant. Training is provided by Deacon Ken Arnold in a three hour class and volunteers complete an on-line Creating a Safe Environment Session (CASE). There are no regular meetings to attend, no dues to pay, and scheduling is flexible to meet the needs of the volunteers. BAIRD NURSING HOME – 125 St Paul Blvd. CHAPEL OAKS – 1550 Portland Ave.
HOBIE CREEK APTS – 111 Brower Rd. ELDER ONE – 2066 Hudson Ave.